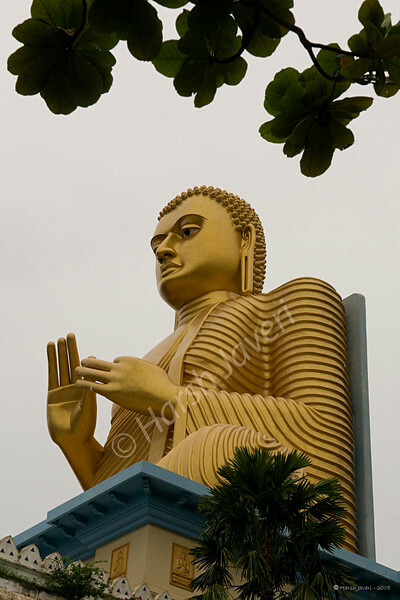 This statue is at Golden temple, Dambulla, Sri Lanka and so TALL it can be seen from miles. The statue is on the top of the temple building. To get an idea, check yesterday's shot. Dambulla is a small town located at a distance of 19 km from Sigriya on the Sigriya-Kandy road. This temple is at the base of the hill that has Dambulla Rock Temple. This is awesome! Thanks for sharing your talent! Fabulous capture of this beautiful statue. Nice perspective. The palm tree gives a great frame of reference for size.